Frank & Elizabeth Syron planned the creation of what has become a golfing landmark. Frank had been the Head Golf Professional at one of the finest private country clubs in Michigan for 14 years and Elizabeth was the proud mother of his 3 children with the oldest being only 4. 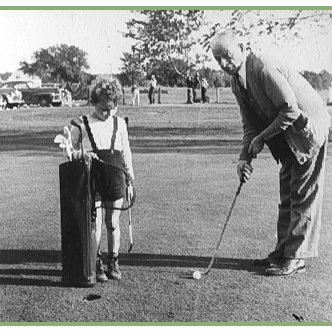 Frank was famous for his teaching ability with his most famous pupil being the great "Babe" Didrikson Zaharias. But his greatest asset was his ability to promote the "great sport of golf." They bought a rundown bankrupt golf course west of Pontiac and renamed it Pontiac Country Club. The early 40's were difficult and there were years when the fairways had to be cut by hand but people were beginning to find the new club in town. After the war, Frank brought in the likes of Byron Nelson, Bobby Locke, Jimmy Demaret, Chick Harbert, Wally Burkemo, Ed Furgo and the greatest trick shot man ever, Paul Hahn to the Club for free exhibitions. The fairways were beginning to be full of golfers. the newly completed remodeled clubhouse and there was no insurance to cover the destroyed building. They knew it would be difficult but still decided to start over again. They had a feeling that the second generation of Syrons might help make things easier for them. The oldest, Lloyd, was tearing up the junior tournaments and had a chance to attend the University of Notre Dame. He earned a scholarship and then went on to win the 1957 Michigan Amateur and became a star on the golf team. During his senior year, Frank Seniors' health deteriorated. Frank drove to South Bend, without Elizabeth, and convinced Lloyd to come back to Pontiac Country Club because he needed him. After graduation in 1958, Lloyd started the second generation of Syrons. His younger brother, Frank Jr., joined him in the 1960s and became a PGA Professional just like his father. The Syron Family: (from left to right) Lloyd Syron, Elizabeth Syron, Frank Syron Senior, Ann Syron and Frank Syron. The game of golf in Pontiac was exploding. The brothers were determined to improve their parent's dream. Every year improvements were made to the golf course. In March of 1969, Frank Sr. finally passed away and Elizabeth continued living in the little white house in front of the clubhouse overseeing the boys until she died in 2002. The "Syron 54 Hole Play Tournament" was started in 1969 in memory of Frank's love for the "game of golf." In a few short years this tournament became one of the most successful events in Michigan for those interested in finding out how their game had progressed. to see how his dream succeeded. The course is kept in excellent condition. Long time greenskeeper, the late Rod Skeleton, saw to that. Lloyd hired him in the 60's when he was only 13 because he got tired of seeing him jump the fence with his dog. Rod learned to be a greenskeeper the old fashion way - with hard work and soon became part of the extended family. We continue to run such a beautiful course today, in part thanks to Rod and his team. Frank Jr. had to retire in the early 80's because of poor health. Before calling it quits, he was named "Boss of the Year" by the ABWA. 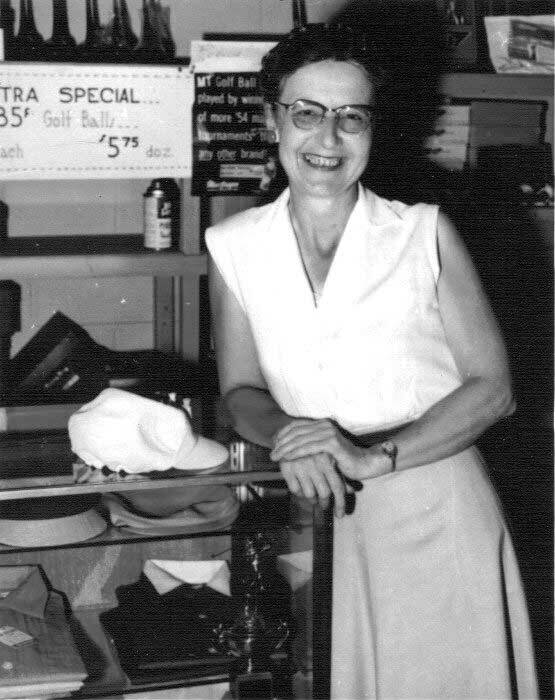 Elizabeth Syron in the ProShop. Lloyd is still proud of what his parents started and what he has helped build and can still be seen daily around the clubhouse. In 1992, the M.P.G.A. inducted him into their Golf Hall of Fame. In 2000, the Waterford Board honored him as the "Business Man of the Year." In 2004, the Michigan Golf Coaches gave a special award to him because of all the good things he has done for junior golf over the years. The Michigan Golf Foundation also inducted him into the "Michigan Golf Hall of Fame" pointing out all the numerous contributions he has made to the "game of golf." Today, there is a "third" generation of Syrons. Mark and Michael, Frank Jr.'s sons, are the most visible managing the ProShop every day. Ann, Frank Senior's daughter works in the ProShop and can be seen walking her dog, General around the course. Bridget, Lloyd's daughter, makes sure that all the food served will be the very best. Tammy Syron can be found waiting tables in the bar room. Maureen and Frank the III help out when they can. After 73 years the Syrons can be proud the dream has been achieved and is still growing. "A great public golf course with a private club atmosphere." (Left) 1960s ~ Frank Senior at Pontiac Country Club. (Right) 1930s ~ Frank Senior at Orchard Lake Country Club.